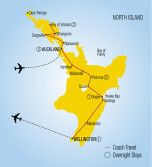 Looking for escorted tours or all inclusive trips to New Zealand? We’ve got you covered! 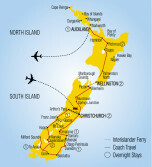 Experience an all inclusive New Zealand vacation with our fully guided escorted tours. Travel with the absolute peace of mind of knowing that your arrangements will be taken care of by professional touring experts. No need to worry about how to get to your destination, choosing the best hotel or looking up where to eat. Every detail is planned for you so you can travel hassle free. But don’t take our word for it – see our client reviews about their tours planned with About New Zealand, or browse more New Zealand vacation packages. We can also tailor your trip for a completely custom vacation. What’s Included in Our Vacation Packages? Our vacation packages contain must-do attractions showcasing the best of this island nation. Our expert guides are familiar with every local area and are on hand to ensure that your trip goes smoothly. They’ll share with you hidden gems, local anecdotes and bits of history to add depth to your tour. Travel safely and at a relaxed pace on our guided tours knowing that you are in the hands of a local expert. Travel in style aboard our excellent modern coach. Relax in reclining seats and get lost in the breathtaking scenery you’ll see out of panoramic windows. Your coach captain will attend to your needs with professionalism and attention to detail. You’ll stay in safe, clean and comfortable hotels welcomed by genuine Kiwi hospitality after your travels. And no need to worry about your luggage – we’ll handle your bags for you. Indulge in fully cooked breakfasts and delicious dinners included in your trip. Explore fine restaurants, cafes and bars on your own during free days. You’ll also experience traditional cuisine through specialty breakfasts, lunches and dinners. Our North Island travel packages immerse you in indigenous Maori culture through guided tours and exhibits such as the Waitangi Treaty Grounds, site of the treaty signing between the Maori tribes and the British. You’ll visit Te Puia, the geothermal wonderland of Rotorua. The bubbling mud pools and colorful hot springs will add warmth to your trip. Enjoy a traditional Hangi dinner, a meal cooked in baskets wrapped in leaves and lowered into a large pit over hot rocks. Watch a powerful display of the haka war song and poi dance for the ultimate Maori cultural experience. Our North Island escorted tours include other top attractions such as the Kauri Museum in the west coast village of Matakohe. You’ll also experience the magic of Hobbiton with a guided tour of the movie set used in the Lord of the Rings and The Hobbit film trilogies. Enjoy a beer or cider at the Green Dragon Inn and revel in the beauty of the Shire. Visit Auckland, the City of Sails, and explore its iconic Sky Tower for spectacular views over the city’s waterfront. Be transported back in time in Napier, the world’s Art Deco capital, and tour its unique and colorful architecture. Experience a personal encounter with New Zealand’s agriculture at the Agrodome, located in a real 350-acre working farm. Have a few laughs with a lively and entertaining show. You’ll also get to pet and feed friendly llamas, sheep, cows and more. Spot bottlenose dolphins and whales on a cruise to the famous Hole in the Rock on Motukokako Island as part of your stay in the Bay of Islands. Looking to see more of New Zealand’s spectacular scenery? Our South Island escorted tours will stun you with intimate encounters of New Zealand’s dramatic landscapes. Travel in our modern coach toward the west coast and see the snowy Southern Alps loom before your eyes. Gaze at the purple lupin flowers bloom beneath you. Dazzle your eyes with the vibrant turquoise blue of Lake Tekapo, brightly colored by glacier flour, or particles of rock finely ground by glaciers. Hike the gleaming Franz Josef glacier for an informative and enjoyable experience of New Zealand’s unique terrain. Tour the fabulous fiords that have famed New Zealand as the world’s picturesque Middle Earth. The quiet majesty of the dark mountain walls and thunderous cascades towering over the waters of Milford Sound will leave you speechless. Board the TranzAlpine for the journey of a lifetime, rated as one of the top eight rail journeys in the world. Traverse through the epic forest vistas, winding rivers and rolling green hills in style. Experience the gorgeous scenery and alpine air in the open carriage or take in the stunning views in the luxury of your large reclining chair. Enjoy a refreshing drink or hearty snack from the train café as you travel across the South Island. 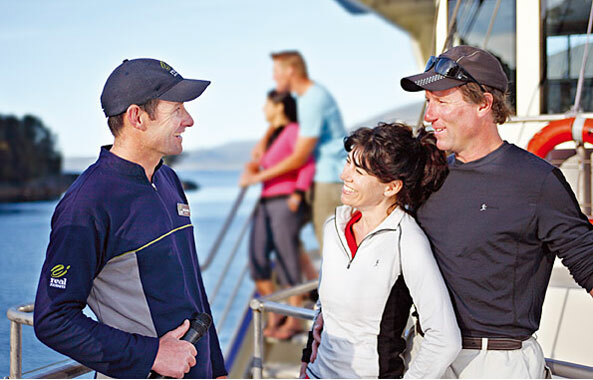 Relax on cruises through the pristine fiords and lakes aboard comfortable and spacious vessels such as on the Milford Sound Cruise and the vintage coal-fired steamship TSS Earnslaw. Cruise Lake Wakatipu in Queenstown and marvel at the snowy Remarkables mountain range surrounding you in our South Island tours. 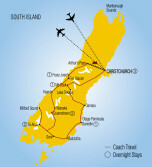 Catch the best scenic highlights, history and culture of world-class cities such as Christchurch, Queenstown, Dunedin and more with informative city tours included in your South Island tour itinerary. You’ll visit New Zealand’s only castle, Larnach Castle in Dunedin. Uncover the interesting history of the castle and enjoy the garden grounds, rated as a “Garden of International Significance” by the New Zealand Gardens Trust. Experience Dunedin’s Scottish heritage with a night of bagpipes and a special Haggis dinner, a savory dish made up of hearty meats and spices. Your tour captain will also assist you in selecting optional tours and sightseeing options available to you on your free days. For those who love to travel but not on your own, then an escorted tour is for you. Try fun new activities, eat local foods & experience the culture while sharing your experiences with others. You’ll make new friendships that may last a lifetime. Our escorted tours offer the unforgettable experiences you deserve. Try fun new activities, eat local foods and discover the culture, as you share your experiences with like-minded travelers. Go on, give us a call and book your all-inclusive guided tour today. The only thing you need to do is pack your bags and leave the planning details to us! Activities: Stunning Landscapes, Guided Tours, Day Cruises, Shopping & Local Markets, Wine & Dine, Garden Restaurant, Short Walks & Hikes, Natural Beauty, Glacier Experience, Local Museums, Castle Experience, Rail Journey, City Sights. Activities: Stunning Landscapes, Guided Tours, Day Cruises, Shopping & Local Markets, Wine & Dine, Short Walks & Hikes, Natural Beauty, Glacier Experience, Local Museums, Castle Experience, Rail Journey, City Sights. Activities: Stunning landscapes, Guided Tours, Scenic Day Cruises, Museums, Leisurely Exploration, Castle Experience, Natural Beauty, Restaurants, Shopping & Local Markets, Historic Villages, Glacier Experience, Rail Experience, City Sights. Activities: Stunning Landscapes, Maori Culture, Guided Tours, Day Cruises, Restaurants, Shopping & Local Markets, Wildlife, Wine & Dine, Short Walks & Hikes, Natural Beauty, Glacier Experience, Mud Pools & Geysers, Castle Experience, Rail Journey, Agriculture Experience, City Sights and Exploration. Activities: Stunning Landscapes, Maori Culture, Guided Tours, Day Cruises, Restaurants, Shopping & Local Markets, Wildlife, Wine & Dine, Short Walks & Hikes, Natural Beauty, Glacier Experience, Mud Pools & Geysers, Local Museums, Luxury Cruise, Dolphin Cruise, Castle Experience, Rail Journey, Agriculture Experience, City Sights. 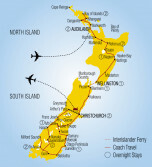 Activities: Stunning Landscapes, Maori Culture, Guided Tours, Day Cruises, Restaurants, Shopping & Local Markets, Wildlife Encounters, Wine & Dine, Short Walks & Hikes, Natural Beauty, Glacier Experience, Mud Pools & Geysers, Local Museums, Luxury Cruise, Dolphin Cruise, Castle Experience, Rail Journey, Agriculture Experience, City Sights.